And let us all hope and pray that we see a motor race, and not a procession! (However, read more on that further down.) Spa is a very different circuit from Hungary. It is a real driver’s circuit, and there is always the threat of rain, which could help bring some drivers forward, and see the ‘power’ drivers slip back somewhat. 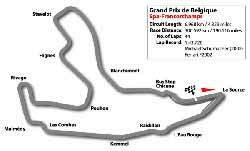 The almost nine mile Spa-Francorchamps circuit was the quickest of all the classic road circuits and many would say, the greatest. It used public roads through the mountains of the Ardennes in Southern Belgium and even in the dry was a circuit for which you needed a good set of cojones. In the wet it was only for heroes and as the region is known as ‘The Pisspot of Europe’, races have frequently been held in the wet. Spa was first used for racing in 1924 and the first Belgian GP was run in 1925, won by Antonio Ascari, father of the double World Champion, Alberto Ascari. Serious discontent with Spa began after a downpour in the 1966 race which caused several crashes, most significantly one involving Jackie Stewart which led to his campaign for improved circuit safety. In 1983 a new 4.31-mile circuit was built incorporating some of the original track, but with an improved surface and run-off areas. The new Spa, which still includes some public roads, is the longest circuit on the F1 calendar and, many believe, the most challenging. A couple of weeks ago I mentioned Pierre Levegh (real name Pierre Bouillon), who was killed in 1955 at the Le Mans 24 hour race when his Mercedes went out of control and went into the crowd killing 83 and injuring many more. Mercedes withdrew from racing at that point and did not return until many years later. I then asked last week, which other manufacturer, despite winning their class also withdrew from racing, scrapping all their race cars, other than one example to be kept as a museum piece. The answer was Bristol. So to this week. Take a look at the photograph of this woman. 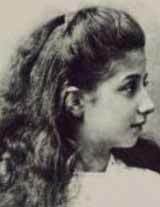 She has probably influenced automotive history more than any other woman in the world. Who is she? I need her first and last names. A couple of weeks ago, I noted that the president and CEO of Mitsubishi Motors Thailand (MMTh), Hisayoshi Kumai, claimed that the Laem Chabang assembly plant is working at capacity, and despite problems elsewhere, including the parent company in Japan, there were no plans to down-size, and in fact they were looking at expansion in Thailand, with more dealerships. Mitsubishi Japan had promised a 21 billion baht expansion fund for MMTh, but new CEO Kumai claims this is still happening, despite plant closures in Japan and Australia. “The investment is well underway and being carried out in stages,” he said. For Mitsubishi’s sake, and for the local employment situation, I hope this continues. However, things do not look good overseas, and since much of the local production is for export, there could be a knock-back effect to the Laem Chabang production facility. In the US, Automotive News reports that the trouble at Mitsubishi has thrown the company’s product plans into disarray and left U.S. dealers in the dark about what new models to expect. Several products under development have been reviewed, revised, canceled, reconsidered or in some cases reinstated. Most of Mitsubishi’s stand-alone U.S. dealerships are losing money, the CEO of the automaker’s North American operations conceded last week. In Japan in July, Mitsubishi Motors new vehicle sales fell to 50 percent of the numbers from a year earlier, now down to 15,862. The company tried to say that the sales were on target, but it hard to imagine any target being 50 percent down, especially since this is in the overall scenario where total sales of all vehicles in Japan eased by only 0.3 percent. A researcher in Australia has discovered that fatalities between 3 p.m. and 5 p.m. on Australian roads from 2000 to 2003 were more than double those between 8 a.m. and 10 a.m. The number of fatal crashes peaked at 106 for the hour after 3 p.m. in both 2000 and 2001, which compares to an average of 48 in the morning peak hour. The researcher challenged the commonly held view that Australians die alone, late at night, driving on country roads. Holden Performance Driving Centre general manager Russell White provided his findings to a driver-fatigue inquiry being conducted by Queensland Parliament’s Travelsafe Committee. “People on the roads at the danger times, whether they be tradesmen coming home from work, mothers picking up their children from school or office workers finishing for the day, are distracted and somewhat fatigued - even if there is plenty of daylight left,” says White. “Fatigue is not just lack of sleep. It’s going through the regular tasks on auto-pilot, thinking about the kids, the job, the shopping, the night ahead.” Russell White’s submission urges the all-party committee to consider education initiatives and improving driver reviver stops. So what do you think the parliamentary committee made of all this? The Travelsafe chairman Jim Pearce, the MP for Fitzroy (an Australian electorate), said the committee would consider recommending tough police powers to reduce the number of fatalities caused by tired drivers! An Aussie government’s “War against Sleep”. This brought the response from Russell White, “How do you police fatigue? You can’t take a random sleep test. You can only ask people when they had their last sleep,” he said. Bureaucratic minds are very small! First off, we learned that despite 20 of the so-called finest racing cars in the world and 20 of the so-called best drivers in the world, they could combine to produce one and a half hours of sheer tedium. I am happy for Ferrari in that they showed their superiority (again) and have already won the manufacturer’s championship, but the rest of the nine teams were crap and the race likewise. 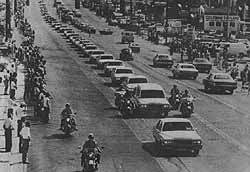 It was a boring procession. At the end of the (dreadful) Star coverage, with the inane tele-bletherers Slater and Goodwin, they have the “exciting moments” of the race replay for viewers to vote upon. Normally they have five of these. At Hungary they could only dredge up four. And what a four! Zonta gently running into Webber on the first corner, Trulli stopping on the main straight (no, I am not making this up - footage of a car parking), Webber’s spin and Michael Schumacher getting the chequered flag. A reflection on just how dead-set boring the race really was. Why do I say those unkind words? Because they are true, that’s why. 27 percent of the remaining cars (other than Ferrari) did not make it to the finish. Ron Dennis’ Mercedes-McLaren lasted 13 laps before expiring. Not bad for a multi-million dollar motorcar! The Sauber managed 21 laps, Toyota got all the way to 31, Renault staggered to 41 and Eddie Jordan’s Jordan managed 48 laps out of the 70. The FIA know they have a problem, but I am still waiting for them to come up with concepts that will produce exciting racing, where we can see real drivers fighting their cars and the other competitors. If the FIA asked any of the local viewers they would hear, get rid of the wings, get rid of all electronic aids and make the drivers shift gears and use the clutch. Forget the ceramic brakes and go to metal discs again to lengthen the braking distances. That’s not a bad start. Then they would hear there should be no refueling, and no new tyres. We want to see drivers passing each other on the track. Not in the pits, and if I hear the word “strategy” again, I think I’ll scream! The best racing driver of all time? With Michael Schumacher scooping the pool and well on the way to his 7th World title by a huge margin, is Schumi the greatest? I do not believe so, and I ask you to look critically at the records of Schumacher and Juan Manuel Fangio. It is always difficult to compare drivers from another era. These days there are 17 or so F1 races on the annual calendar, while before there was about half this number. Races are much shorter today, both in distance and in time. Three hours was commonplace in the 1950s. The cars are very different, and in the ‘good old days’ the drivers were totally in control. There was no launch or traction control, or automatic gearboxes. So to be able to compare results all that you can do is look at how many wins or podiums the drivers have managed, as a percentage of the total F1 races they had entered. Taking Juan Manuel Fangio first. To win his five world championships, he competed in 51 F1 Grands Prix, and won 24 of them. Put another way, he won 47 percent of all the GP’s he started in. Now if you look at total podiums, Fangio had 35, that means that he ended up on the podium in 69 percent of all the F1 events he lined up for. Now let’s apply the same yard-stick to Michael Schumacher. He has won 82 of the 207 GP’s he has been in, so he has won only 39.6 percent of his F1 events. Total podiums for Schumi are 134, that is 65 percent of the time he has ended up on the podium. Conclusion - Fangio won a greater percentage of his events than Schumi has done, and ended up on the podium more times percentage-wise as well. 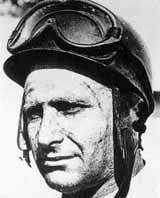 Juan Manuel Fangio wins!